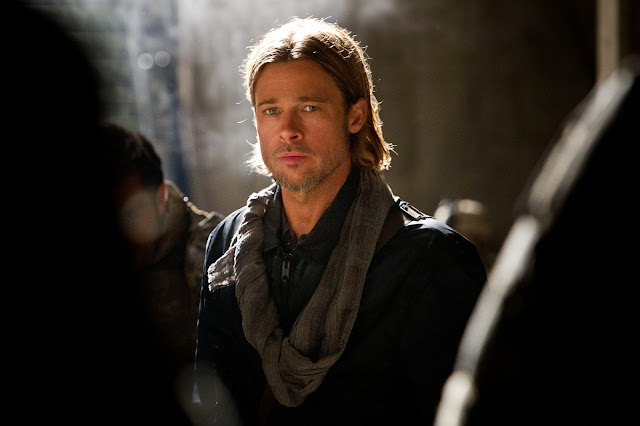 Despite its well documented production problems, World War Z manages to be a stunningly refreshing and original take on the zombie film - boasting an exceptional lead performance from Brad Pitt and thrilling direction from Marc Forster. Pitt stars as United Nations employee Gerry Lane, drafted in to help find the source of a zombie epidemic that is spreading the world. It's the globe-trotting style of World War Z that makes it slightly more interesting than your average zombie flick. The action begins in New York (which many Scots will recognise as Glasgow) then goes global with Lane venturing to South Korea, Israel and Wales. This establishes a sense of the outbreak as an uncontrollable global pandemic of staggering magnitude - capturing all corners of the globe under threat. The most interesting of these is undoubtedly the Israeli based action where we see the Middle Eastern nation protected by a huge wall keeping out the hordes of infected. The paradisiacal landscape is soon overrun by the creatures in a thrillingly tense sequence which sees the masses of zombies scale the wall. This is just one of the many high-octane set-pieces, others include a downright terrifying raid on a darkened apartment block, a zombie outbreak on board an airplane, and the conclusion's nerve-shredding cat-and-mouse chase through a clinical health centre. Forster handles these with a firm sense of tension, suspense and unease - surprising viewers with a multitude of striking horror imagery and original jump sequences. Whilst the supporting performances may prove forgettable, Brad Pitt leads the cast with his usual magnetism and command of the screen. Pitt makes the outbreak seem very real through his focussed performance that is packed with realistic emotion and commanding screen presence. Despite sticking to a rather linear 'one hero saves the world' structure, Matthew Michael Carnahan, Drew Goddard and Damon Lindelof's screenplay remains solid thanks to the geo-political element. The political sequences strike parallels with Steven Soderbergh's fast-paced epidemic thriller Contagion, whilst the zombie action shares a similar excitement and originality of George A. Romero's early work. However, it is apparent in the film's somewhat unsatisfying ending that rewrites and reshoots did take place - although this is unlikely to hinder your enjoyment of the feature. World War Z is a true zombie epic - filled with fast-paced horror and action, a masterful leading performance from Pitt, and an inventive globe-trotting narrative. I'd go as far to say it's the best zombie film in recent memory. I originally featured this review on The People's Movies.